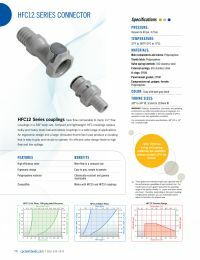 The HFC12 Series has flow comparable to many 3/4" flow couplings in a 3/8" body size. They are compact and lightweight, making them an excellent replacement for bulky and heavy metal ball-and-sleeve couplings in a wide range of applications. HFC couplings are ergonomically designed with a large, shrouded thumb latch pad resulting in a coupling that is easy to grip and simple to operate. The efficient valve design leads to high flow and low spillage.